This is a complete lesson with instruction and varied exercises about how to multiply a whole number by a decimal (fifth grade). The lesson contains a variety of exercises, including pattern exercises, cross-number puzzle, a riddle, and word problems. In the video below, I explain how to multiply decimals by whole numbers: think of your decimal as so many "tenths", "hundredths", or "thousandths", and simply multiply as if there was no decimal point. The lesson continues below the video. Multiplying a decimal by a whole number can be solved by repeated addition! Since we repeatedly added a number with tenths, the answer also has tenths. Since we repeatedly added a number with hundredths, the answer also has hundredths. Since we repeatedly added a number with thousandths, the answer also has thousandths. 1. Write each multiplication as a repeated addition, and solve. So, in order for it to be hundredths, your answer needs to have two decimal digits: it is 0.30. Similarly, 7 × 0.008 is going to be thousandths, so it needs three decimal digits. So, first multiply without the decimal point: 7 × 8 = 56, and then figure that the answer has to be 0.056. 2. Put the decimal point in the answer. 4. Multiply and compare the problems in each box. 5. Multiply and compare the problems. parts: 5 × 3 and 5 × 0.07. Sharon jogs 1 1/2 miles four times a week. Who jogs the most distance during one week? b. Is 1.6 more than, less than, or equal to one and a half? c. One kilogram equals 2.2 pounds. How many pounds are five kilograms? ten of them in a box that is 15 cm high? How about twelve of them? What is the maximum number of books you can stack in the box? 0.6 is equal to 0.60 and to 0.600. Similarly, 1.25 is equal to 1.250, and 6.00 is equal to 6. If you “tag” more zeros on the end of a decimal number, these will not add any “value” to the number. It is customary in mathematics to give your final answer without these ending decimal zeros. For example, 5 × 0.08 = 0.40, but it is customary to write your answer as 0.4 instead of 0.40.
it is better to write your answer in the simplified form as 7. By the way, in science this is done differently, and decimal zeros are retained in accordance with the accuracy of the measurement. 8. Multiply and simplify the answer (do not write the decimal zeros at the end). 9. Write the problems in the “answer” boxes where they belong. 10. Put the letter of each problem under the right answer, solving the riddle. How did Mrs. Decimal feel when she lost her decimal point? You can make worksheets for decimal multiplication here. 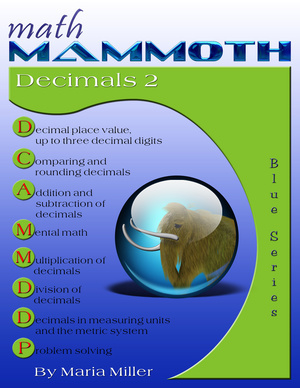 This lesson is taken from Maria Miller's book Math Mammoth Decimals 2, and posted at www.HomeschoolMath.net with permission from the author. Copyright © Maria Miller. A self-teaching worktext for 5th-6th grade that covers the four operations with decimals up to three decimal digits, concentrating on decimal multiplication and division. The book also covers place value, comparing, rounding, addition and subtraction of decimals. There are a lot of mental math problems. Download ($6.25). Also available as a printed copy.